High Alert for all aspirants…Searching the Jobs in Madhya Pradesh is much easier for all now. All the job aspirants can now get the Latest Govt Jobs in MP and Upcoming Government Jobs in MP 2018 every day. 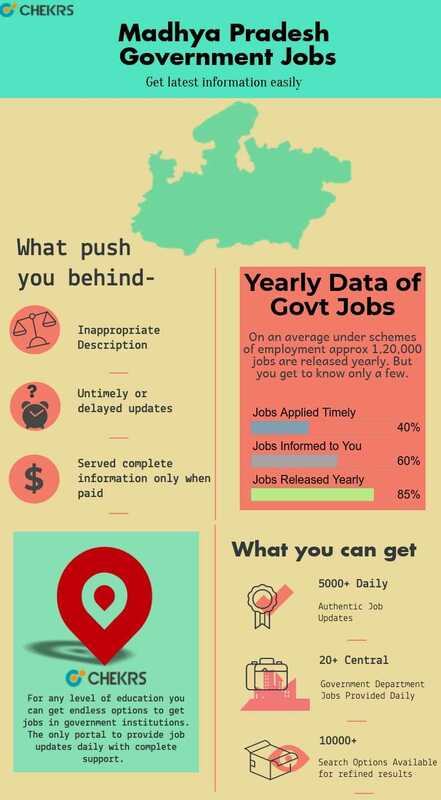 With the central government implementing new schemes to increase employment, the state government regularly releases Madhya Pradesh Govt Recruitment. But not all of these MP govt vacancies get filled due to lack of information. But not more, regardless of the highest educational qualification you have, you can get the best Government Jobs in MP. It is possible to every day updates of best paid Jobs in Madhya Pradesh through subscribing the services of jobs.chekrs.com. We understand how important for you it is to get the MP Sarkari Naukri 2018. That is why if you want to save you time and receive to the point information that Chekrs is your solution. For every Government Jobs in MP, that is released you can find out its eligibility, selection process, application submission details, its exam dates, admit cards and lastly the results as well. What all is provided at Chekrs? You can never miss performing really well in any of the Madhya Pradesh Govt Jobs exams. As far as you follow help provided by the Chekrs you can stay ahead of others and beat the competition. Which every exam you appear for, here you can check out the additional study material such as the papers, free test, GK updates and above all tips to prepare.